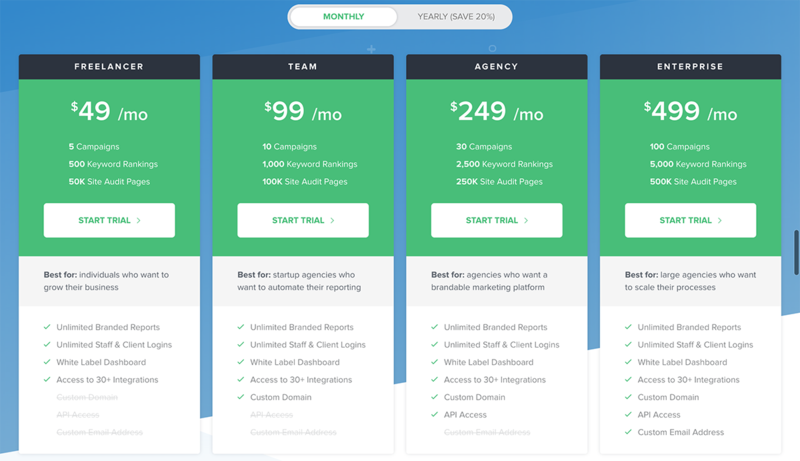 Complete information about our pricing tiers and membership levels can be found at AgencyAnalytics.com/Pricing. We offer four membership levels. All levels include access to all available dashboard modules and 3rd party integrations. We also offer a 20% discount when you pay for an entire year in advance. There are no pro-rated refunds available on yearly packages if you decide to cancel early. On our main pricing information page, click the "Yearly (20% off)" button to toggle to yearly pricing. Note: Customers occasionally ask if we offer "a la carte" pricing, with the ability to pay for only the modules and features that they plan to use. To keep things simple and scalable, we don't currently offer a la carte pricing, and have no plans to do so in the future.